It seems like everyone is drinking smoothies these days for the health benefits. But, to go out and buy a smoothie can cost a lot more than you might be willing to spend on a drink. So, you need to get the ingredients needed to make your own healthy and delicious basic smoothie recipe. What goes into a smoothie? Well, you are pretty much only limited by your imagination. If you have never made your own smoothies, read on to learn more about the health benefits, the most popular ingredients, smoothies for kids and some other delicious recipes you can try right now. There are so many health benefits that come from drinking smoothies. They are loaded with fruits, vegetables, and other healthy ingredients that are loaded with nutrients, and they taste great. Here are five awesome benefits you can get from drinking smoothies. Get Nutrients – You can get most or even all of the daily recommended amount of vitamins and minerals just by drinking one healthy smoothie. Lose Weight – You can find all kinds of delicious smoothies that are diet-friendly, and many even help to promote weight loss. Better Digestion – Your fruits and veggies are in liquid form, so they are a lot easier for your system to digest. Look Better – When you are getting the proper nutrients in your diet, you will have gorgeous skin, hair, and nails. Healthy Immune System – Smoothies made with vitamin-rich fruits and vegetables will help to boost your immune system. As long as you have a good quality blender, you can easily make your own smoothies right at home. You don’t need to go out and get any special juicers or smoothie machines. Simply combine all of the ingredients into the blender, and puree until the mixture is the consistency you like. A lot of kids don’t like many vegetables, and it can often be a battle to get them to eat their veggies. We know that they need the nutrients in vegetables in order to be healthy, but all they see is yucky looking vegetables. You can disguise vegetables in a basic smoothie recipe, and they will never know the difference. The fruits you use in their smoothies will overpower the flavors of the vegetables, and all they will taste are the fruits. Here is a healthy smoothie mix that kids love. A lot of people are unable to digest dairy products, and are not able to enjoy a regular smoothie made with yogurt. But, there are ways to get the nutrients and flavor of a smoothie. For instance, you can use juice and soy milk instead of yogurt. Here is a delicious and healthy recipe for a dairy-free berry smoothie. This is also another smoothie that kids really love, and it is loaded with vitamin C. You don’t need ice for this smoothie, because the frozen berries do the job instead. When they thaw, they won’t water down the drink. Now you have some ideas about which ingredients to use in your basic smoothie, and a few delicious and healthy recipes to get you started check out our latest blender recipes. 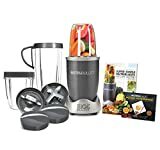 Once you get used to making smoothies, you will know the best ratios of fruits and vegetables, and you can start creating your own awesome smoothies.